Description: Sierra Pacific Wood is full of everyday things ready for personalization. You can paint, stamp, glue, distress, or even leave the wood the way it is. 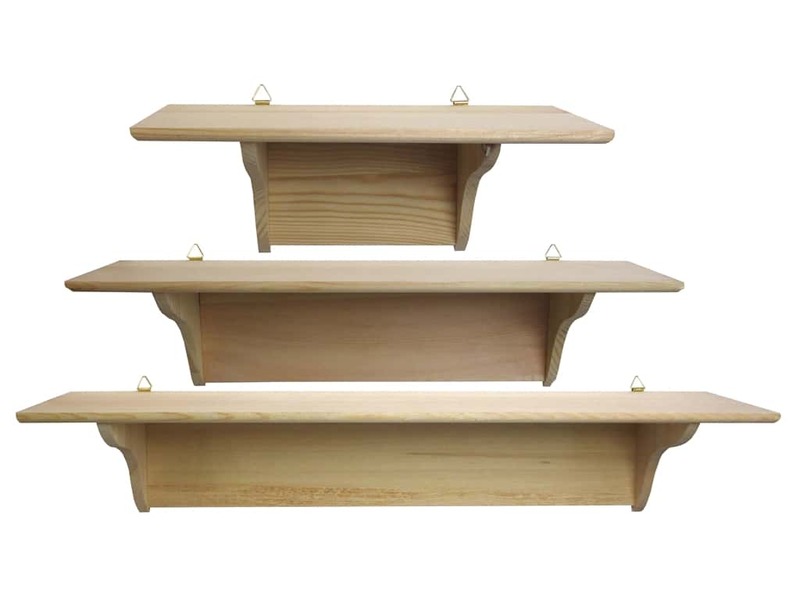 Shelf Curved Brace Set of 3- Includes 3 unfinished wood shelves with a rounded front edge. Shelves measure approximately 11.5 in. x 5.25 in. x 4.5 in., 17.5 in. x 5.25 in. x 4.5 in. and 23.5 in. x 5.25 in. x 4.5 in. . Triangle hangers are attached to back of each shelf. SPC Wood Shelf Curved Brace Set of 3 -- CreateForLess 3.00 out of 5 based on 1 ratings. 1 user reviews.